Ever notice the lack of runners on the streets when it's raining? I'm not talking about a sprinkle or a passing shower, but one of those systems that sets in for days creating ponding wherever you look. We had one of those type days last Saturday here in the Heartland, more specifically Lee's Summit Missouri. Funny, I got a response to my race report of the night before from a area runner friend who said they might put off their 15 miler for Sunday since it was raining so much that Saturday morning. Hmmm ... that would compel me out the door, in my thinking, quicker than the promise of a sunny Sunday. I love running in the rain! Guess it depends on perspective. I embrace the rain, as I have stated several times in my writings, because it is my play time. I suppose as a shod runner it is a bit more wearisome to run when one's shoes and socks are squishing from all the water they have absorbed. Then, there is the possibility of blistering from socks that are constantly rubbing heels ands ankles. This, of course, has not been my experience for the past several years. Then there is the constant feeling of wetness that I suppose some runners don't like. Personally, I love being wet when I run. I love running through puddles, muddy areas, small rivulets, wherever it is wet and I can stay wet. I think it must come back to that perspective thing, and maybe more important, expectations. I totally expect, when I go out to run, no matter what the weather to have a good time. 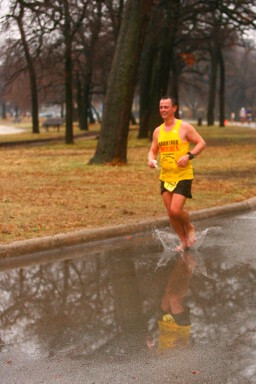 Usually, when I write about running and playing in the rain, I get a few folks that respond and say, "Hey, I'm with you! I love running in the rain and I don't care if my shoes get all wet or that I'm drenched when I get back home, or what!" Well, these are runners that have taken on an attitude of gratitude, in my opinion -- to look for opportunity no matter what the weather is like. Maybe it is also old parental tapes that "play" in runners' minds. Maybe that is why more don't run in the rain and find out the joy of acting like a kid again. I bet some will hear their mother's voice in their head say, "He/she doesn't have the sense to come in out of the rain". Or, "I bet they're going to catch their death of a cold" (even though it is summertime. Hah!). People probably had a lot more reason to be fearful of the effects of rainy weather a generation or two ago when folks led more sedentary lives and did not build up their immune systems as we do in our generation by better living and eating standards. Today, we can enjoy the risk factor a little more because of our healthier lifestyles. Then, there are those who are always going to see the "puddle half empty" -- who have calculated their lives to limited exposure of those things they believe will eventually "get" them. These are definitely not free people, in my opinion, but lead their lives in a fearful structure that limits their involvement in anything remotely associated with a risk. God does not want us to be stupid here on earth, but I do believe He wants us to have fun. I believe he wants us to enjoy the rain, not so much as a spectator but as a willing participant -- to allow it to drench us at times and to be puddle stompers. These can be fun excursions for runners, for walkers, regardless of age. One must only see the puddle half full and take advantage of a fun opportunity, and not be intimidated to wait for the clearing sky. God's opportunities present themselves even in the midst of the storm clouds. It is all what and how I perceive. May our cups (and our puddles) continue to overflow.